Used BMW Z4 Review - 2009-2017 | What Car? 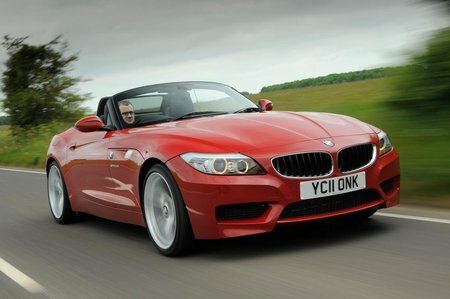 What's the used BMW Z4 sports like? This second generation BMW Z4 took over where the first-generation model left off, and promised similarly involving handling while resolving the stiff ride that blighted the earlier car. But the Z4 had to be at the top of its game, as second generations of the Audi TT Roadster and Mercedes SLK had both made real strides to improve the stodgy handling of their forebears; meanwhile, the Porsche Boxster was the handling king of the class, giving the Z4 plenty to live up to. To widen its appeal, BMW offered greater customisation of the driving experience through electronic chassis control systems such as Drive Performance control, which allows the throttle, steering, and stability control program to be altered; along with optional adaptive M Sport suspension - standard on 35is models - to make sure the car was less compromised during everyday driving. The quality of materials in the interior was also improved to make the driving experience more comfortable. The dashboard featured a much clearer design with major controls placed easily to hand. Z4s equipped with satellite navigation received the reworked iDrive infotainment system, featuring more shortcut buttons than previous iterations, making it much simpler to use whilst on the move. BMW also went to the trouble of putting a folding metal roof on the Z4 to make it a more usable everyday car, with the added benefit of increased protection against thieves. With the roof down, this steals boot space in order to house the roof panels and additional folding mechanisms, but it does mean that the car is quieter on the motorway with the roof up. Engine choices range from an entry-level 154bhp 18i 2.0-litre four-cylinder car up to a 335bhp 35is six-cylinder – the latter of which remained the most powerful model throughout the Z4’s life as there was no Z4M. In 2011, BMW swapped the 23i and 30i versions for 20i and 28i models, powered by 2.0-litre engines of 181bhp and 245bhp respectively.